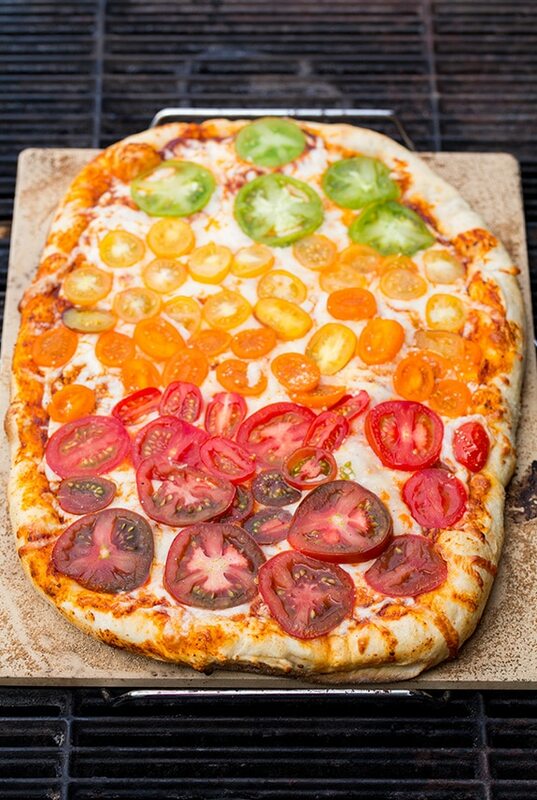 Grilled Rainbow Tomato Pizza and a Giveaway! 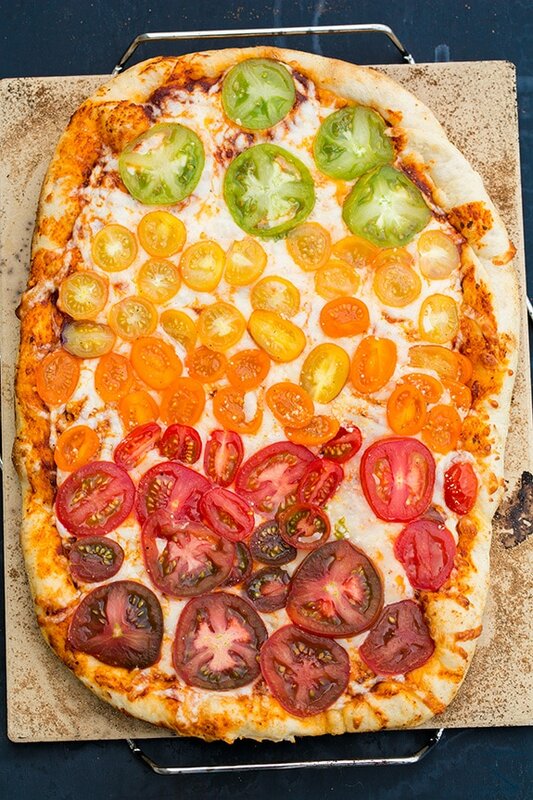 Home » Main Dish » Grilled Rainbow Tomato Pizza and a Giveaway! 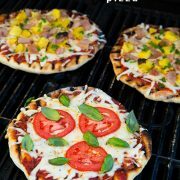 Many of you have your go to grilling foods that you grill every summer time and time again, but have you tried your hand at grilled pizza yet? Grilled pizzas were actually one of the first foods I learned how to make because I was so intrigued by the whole idea of it. I love the flavor that a grill has to offer and I also love the idea that during the summer it keeps the heat outside. The grill just offers a flavor that the oven can’t with pizza, it gives it a flavor like pizza you’d buy at a stone fired oven pizza restaurant. Before I used to always grill my pizzas without a pizza stone and recently I picked up one from World Market. I’ve loved it so much that I used it three times this week and I think I’ll head back to get one more so I can cook two pizzas at once for entertaining. 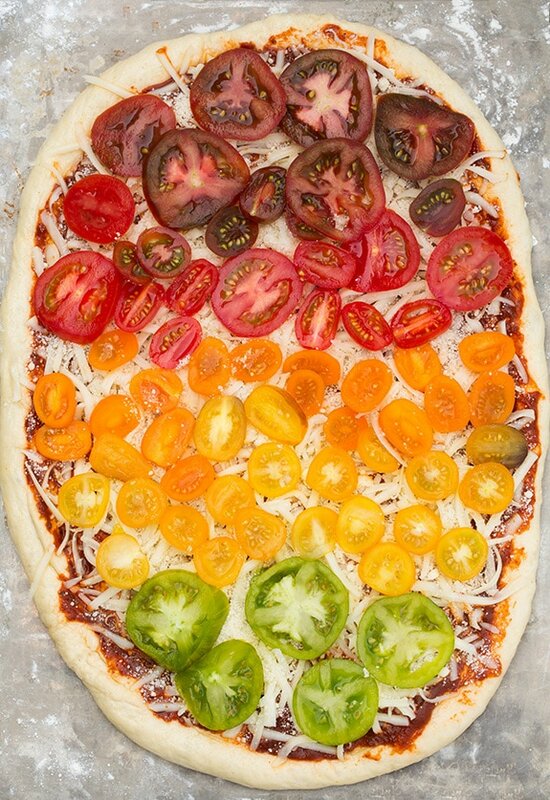 I also picked up so many delicious ingredients to help create this memorable summer pizza. 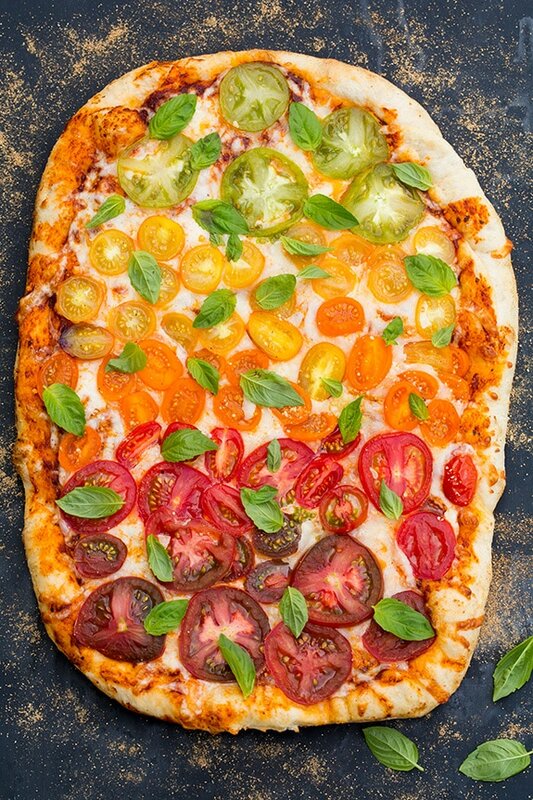 I can’t tell you how much I loved the Pastorelli Pizza Sauce they sell which I used for this heirloom tomato pizza. It’s perfectly thick and rich and has such a wonderful depth of flavor. I was licking the spoon clean after spreading it over my pizza. 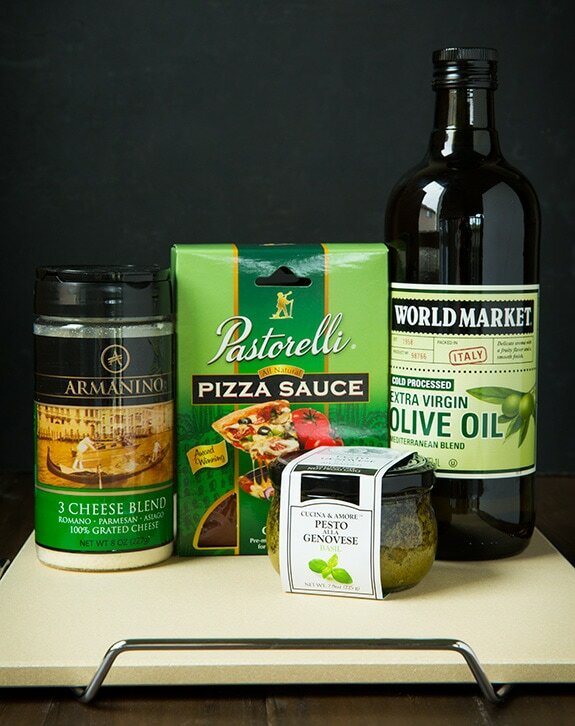 World Market has so many fantastic items to jump start your grilling season this year! I’m in love with that store and have always been from the first time I stepped in many many years ago. There is just such a fun, authentic ambience to the store and I love how so many different cultural items are found in one big store. The whole idea of it is brilliant and there’s just no store like it. And when you get to the food section it’s as though you landed in food Heaven. There are rows of chocolate and candy and drinks and specially foods you’ve searched for at grocery stores 10 times over but they’ve never had them. Let’s just say I never leave this store empty handed and I love what I bought this time around to get my pizza grilling season started! What’s pizza without soda? 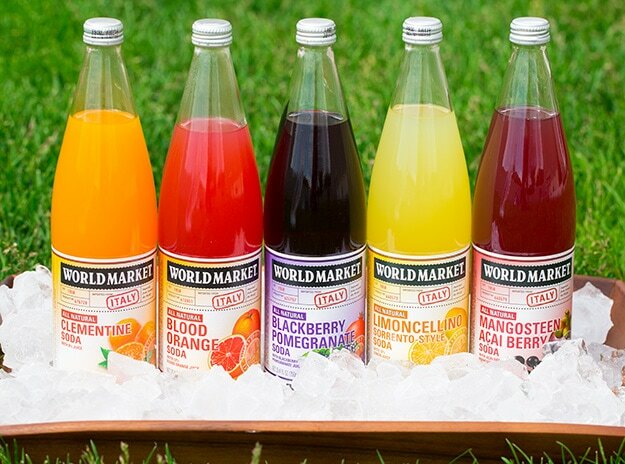 And what better to serve grilled pizza with than these all natural fruit flavored sodas imported from Italy? I’ll take a tall glass of each please! My favorite is the Mangosteen Acai Berry, it’s completely irresistible and utterly refreshing. I’ve been on the lookout for the perfect water dispenser for summer. I’ve wanted a glass one, one that doesn’t leak when the spout it closed and one that has a sleek, classy look. This one from World Market perfectly fit the bill. 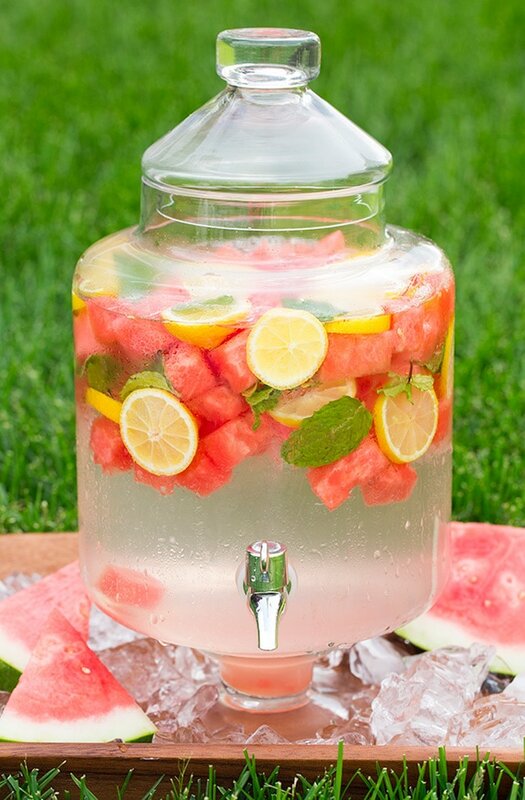 It worked great for this Watermelon Lemon and Mint flavored water. To make this poke plenty of watermelon cubes with a toothpick or fork several times then add to a pitcher along with a fair amount of mint (I ran out but I’d recommend more) and some lemon slices (squeeze juice of some in before adding), then add cold water and ice. Let rest 1 – 2 hours for more flavor. Just as you would preheat your oven or skillet, always remember to preheat your BBQ about 15 minutes before cooking. This ensures a nice sear and keeps meat tender and juicy during grilling. While grilling, remember to only lift the grill lid when absolutely necessary in order to retain built up heat in the grill. This also helps to prevent flareups as it cuts off oxygen. Marinades and basting sauces, many of which have a high sugar content, will burn easily. For this reason, only baste the last 1-2 minutes of cooking. Always remember to brush food with oil or grill gates with an oiled paper towel before grilling to prevent sticking. And last but not least, always use a thermometer to check meat for doneness. And don’t forget about dessert! 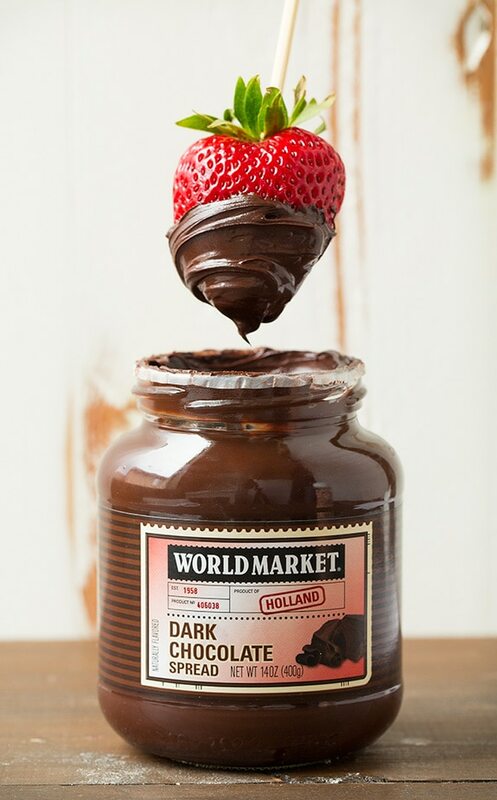 How could I resist this World Market Dark Chocolate Spread. I’ve been using it for s’mores and fruit and I love that I just have to open the jar and it’s ready to go, no melting or extra mess! 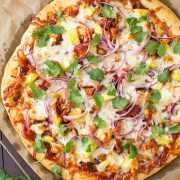 The perfect summer pizza recipe! Pizza crust is topped with sauce, mozzarella and fresh tomatoes then cooked on the grill for that delicious lightly charred flavor. Set a rectangular pizza stone over grill. Preheat a grill over moderately high heat. Let pizza stone pre-heat 30 minutes (grill should be about 475 - 500 degrees so reduce temperature slightly as needed). During the last few minutes of stone preheating, dust a pizza peel (or a rimless cookie sheet) with flour and cornmeal. 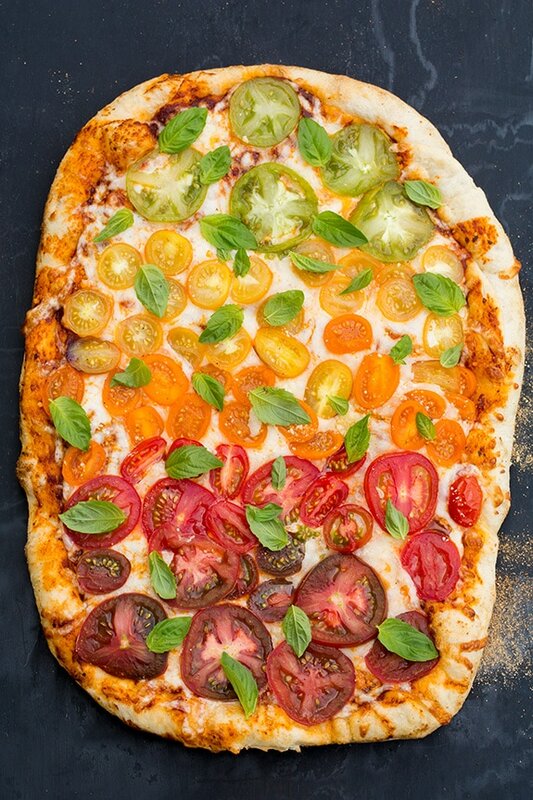 Stretch and shape pizza over floured surface to about an 13 by 9-inch oval while creating a taller rim around edges. In a bowl stir together granulated garlic and olive oil. Brush over top of crust (don't let it drip down sides). Spread pizza sauce evenly over top, leaving rim uncoated, then sprinkle over mozzarella and three cheese blend. Top with sliced tomatoes. (At this point gently shake the pizza peel to make sure crust isn't sticking, if needed lift each edge and dust more flour/cornmeal under). Carefully slide pizza from pizza peel onto preheated stone (you may need another flat object to help coax it from the board since it's fairly heavy, such as another peel or thin cutting board). Close lid and allow to grill 6 - 9 minutes until cheese has melted and crust is golden brown on bottom. Using pizza peel remove pizza from pizza stone. Top with fresh basil. Cut into slices and and drizzle each slice lightly with extra virgin olive oil. Serve warm. This post was sponsored by World Market, but all thoughts and opinions are my own. Cat: Hi Jaclyn! 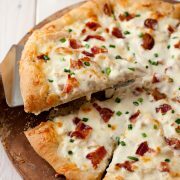 The pizza looks soo delicious, but I have to admit that all the this in this post look mouthwatering!!! Oh, that Chocolate Dip… Wonderful! Can I ask you what are the ingredients in the Pastorelli Pizza Sauce?